Budget backpacking in French Polynesia is still a relatively new thing but tourism is not new on the Society Islands. Unfortunately with the long history this area is reluctant to breakaway from that resort priced mentality. But fortunately the infrastructure for independent travel is slowly building. 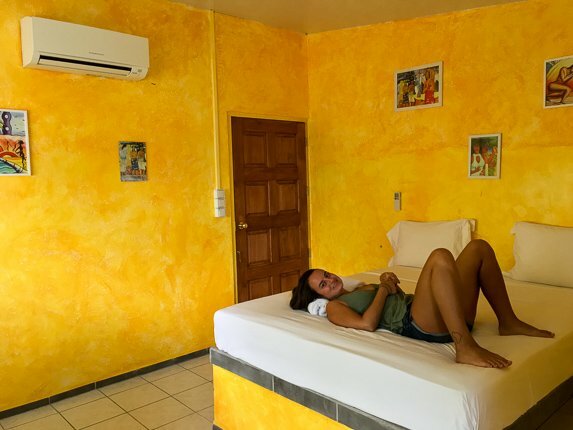 The prices are still high, making it difficult to travel long term here, but it is possible to spend a few days in true paradise on a backpacker budget. The Society Island archipelago is a collection of 14 islands, split into two groups, the Windward Islands and the Leeward Islands. Of the 14 islands only 7 are accessible for most tourists. Tahiti is the capital island and industrial hub of French Polynesia. 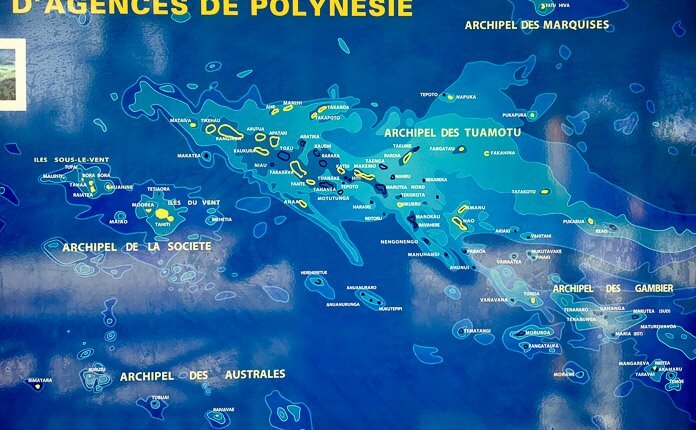 If you are flying in to French Polynesia here is where you will begin your backpacking adventure. 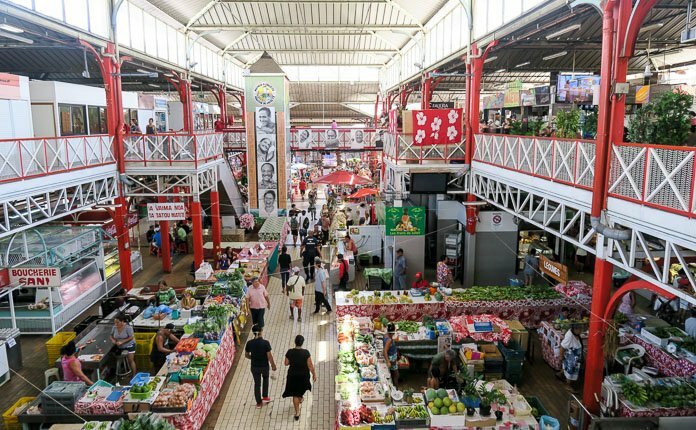 The capital city of Papeete will most likely be your entry point. 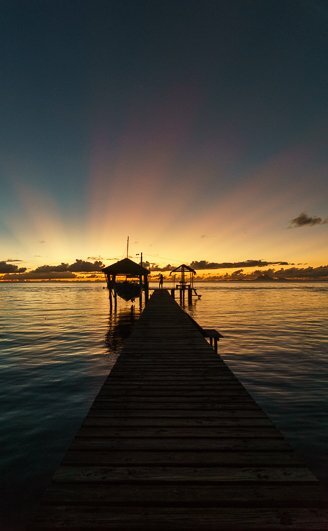 Located on the island of Tahiti, Papeete is the most populated city in French Polynesia. 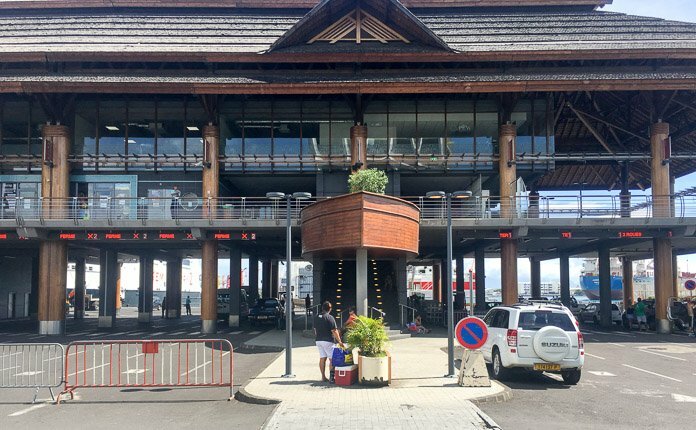 Papeete will be your one stop hub to organize your adventure and grab all the necessary supplies before you leave the island. 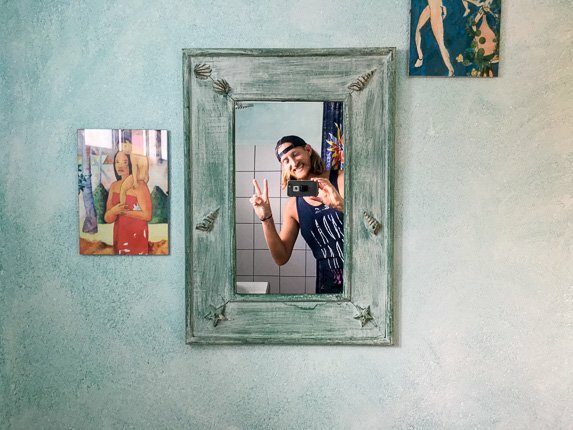 Papeete has a brand new hostel, actually it is the only one in town, named Mahana Lodge and Maui is a great, helpful owner. If you plan on exploring more of Tahiti, maybe to surf in the south or going to see the black sand beaches, be aware that the Le Trucks or buses run in three separate routes, none of which are regular. Buses do not run at night and it is impossible with public transportation to circle the island in one day. 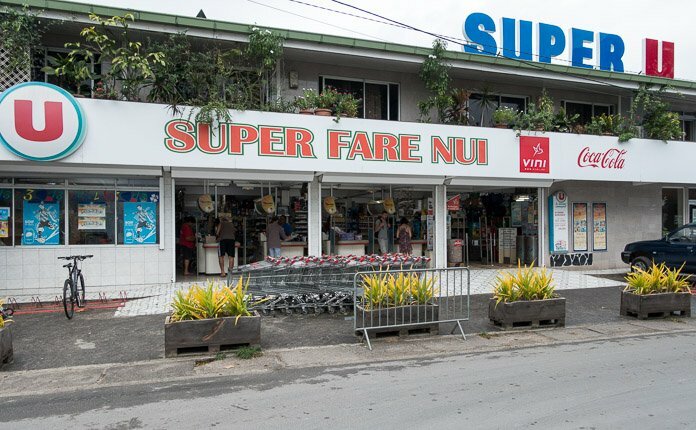 Tahiti is a massive, for island standards, so renting a car or scooter is the best way to see the island. Renting can be expensive, $35-100 USD per day, Eco-Car is the cheapest option. 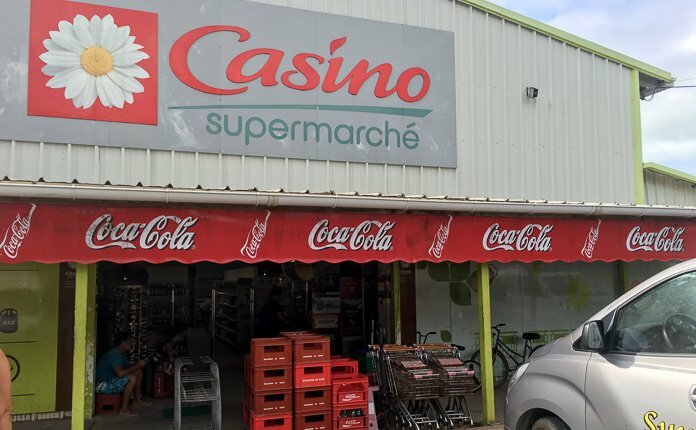 If you are looking to rent a scooter make sure your drivers license specifically says that you are able to drive motorcycle otherwise you cannot rent a scooter in French Polynesia. 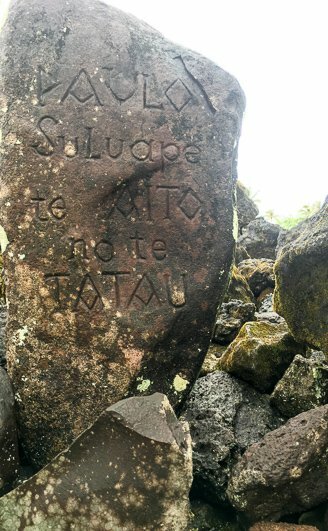 On Tahiti there are two hiking trails you are able to do without a guide, but do not attempt either if it just rained or will rain. Mount Aorai – Tahiti’s second highest peak, has a trail-head that starts just beyond the O Belvedere restaurant, Located +5km from the harbor area downtown. Getting to the trail-head is the difficult part without your own transportation but if you opt to walk or hitchhike be aware that the hike in general takes 2 days to complete so plan accordingly. The hike is +10km each way with 2 free huts for overnight hikers to sleep in. The Mount Aorai hike can be dangerous so make sure to let someone know you when you are hiking. Fautaua Valley – Technically you need a permit to do this hike and like the rest of French Polynesia that might be difficult to obtain. If you want to try just head down to city hall and give it a go. The hike starts at the end of Avenue Pierre Loti next to the Fautaua River and takes roughly 5 hours round trip. Bring your waterproof camera because Fautaua Fall is the 28th tallest waterfall in the world. 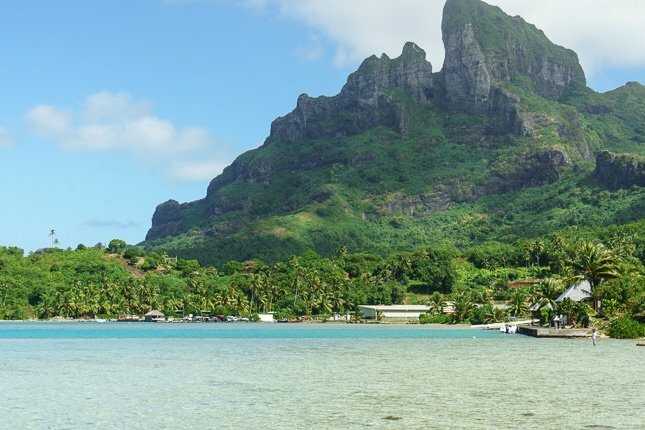 Tahiti and Moorea are two of the cheapest islands in French Polynesia to backpack but of the two Moorea is the better choice, here you can get away from the busyness of Papeete and relax a bit. 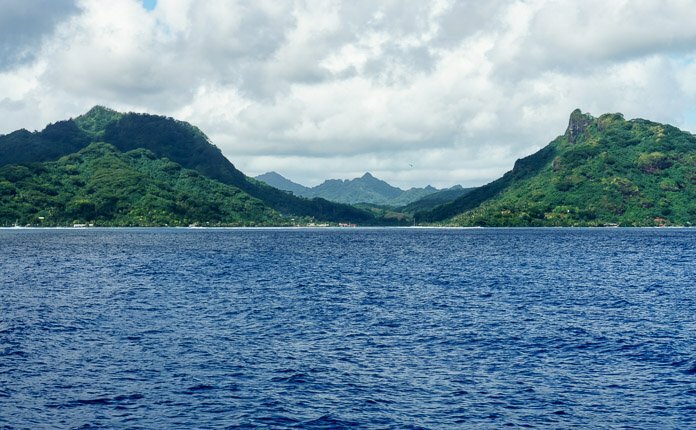 Moorea is a lot smaller than Tahiti making it easier to explore. 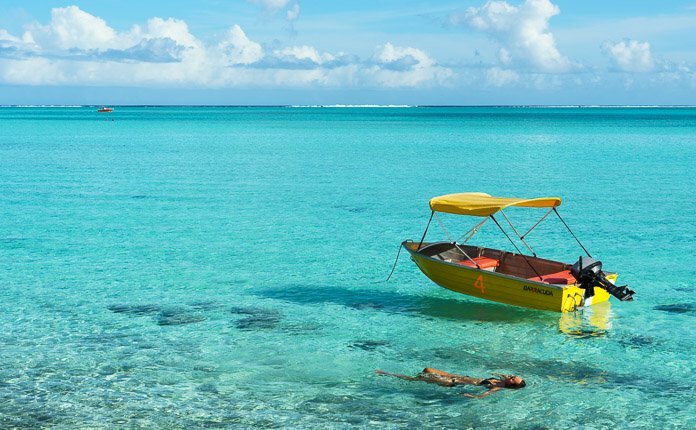 Aptly named as the “Magic Island,” Moorea is just a short 30 minute ferry ride from Tahiti. Ferry tickets are available next to the harbor in Papeete. 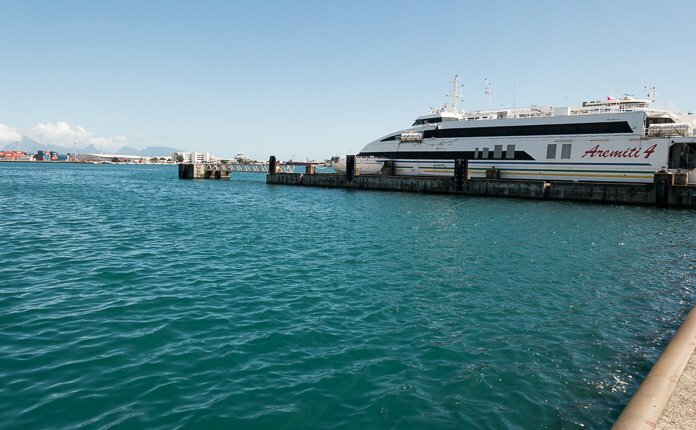 Two companies, Terevau and Aremiti each run a ferry 6-7 times per day. Terevau is cheaper but the Aremiti does have the added cost for transportation from the ferry dock to your destination. Otherwise to get around the island you can rent a bicycle at the ferry dock, nice if you are only visiting for a day and without your backpack, you can rent a car or scooter or attempt to hitchhike, which could take a while. Moorea has not bus system, taxis are available but they are very expensive. 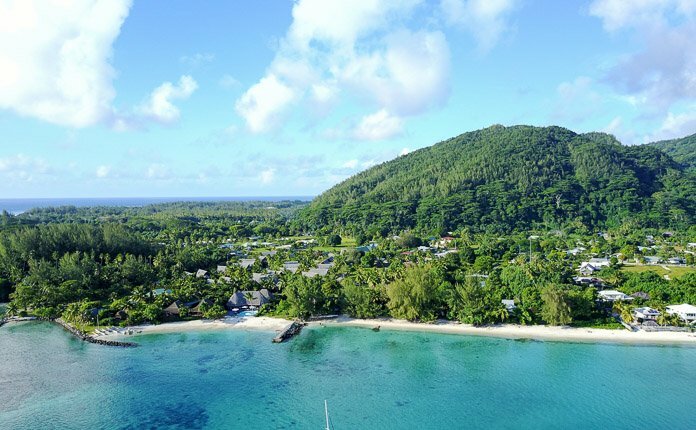 The two budget accommodation options on Moorea are Pension Motu Iti and Camping Nelson, both offer dorm style accommodation and Camping Nelson also offers camping. The reviews are similarly not fantastic but for the price it is what you get. 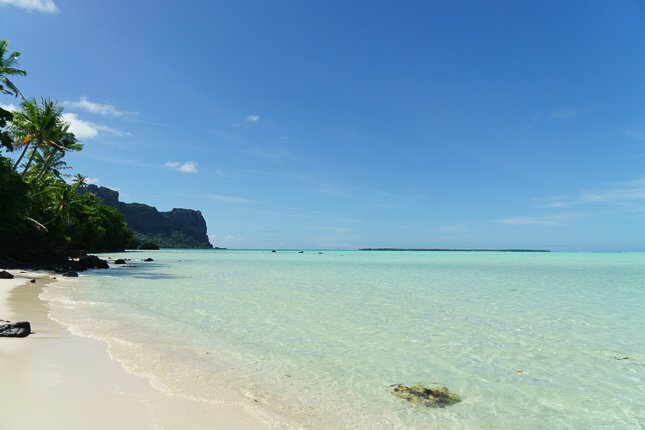 Moorea is known for its nature and has plenty of opportunities for hiking, diving and relaxing by the beach. The best beaches are concentrated on the northern side of the island. 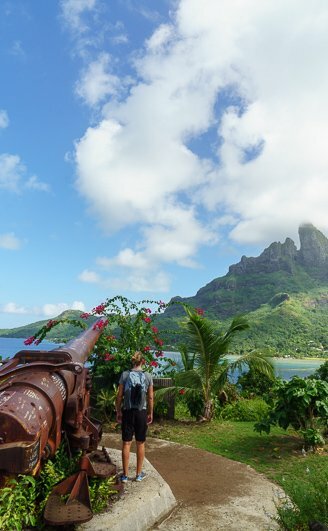 Moorea offers some independent hiking with Mount Rotui being the most popular. The trail-head starts nearby the Hilton Resort. For great views make your way to the Belvedere and Toatea Lookouts, also a visit to the pineapple fields is a must. 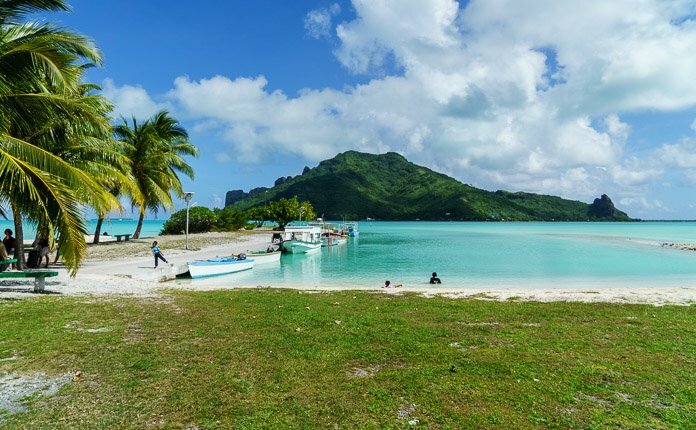 The new, hip, destination of the Society Islands, Maupiti is compared to Bora Bora of 30 years ago, before the resorts. With an island wide boycott on resorts the only places to stay on the island are through local home stays or by camping on the motu. Lacking any infrastructure most of the home stays offer rooms with half board, breakfast and dinner, included. This greatly increases the price per night and puts you at the mercy of your host. With high demand and few places to stay, most home stays book well in advance. When booking ask for a discount price to camp in the yard instead of having a room. The only official campground on Maupiti is located on Motu Auira and it is not well maintained. The campground is expensive and you do not have access to any amenities. 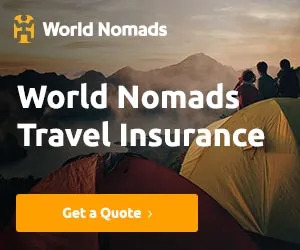 Basically you are paying to put your tent on someone’s land. In order to get to the nearest store for water and supplies you need to wade across Motu Auira then walk almost an hour to town. If you plan on camping bring plenty of supplies from Tahiti. The great thing about Maupiti is that the water is beautiful. 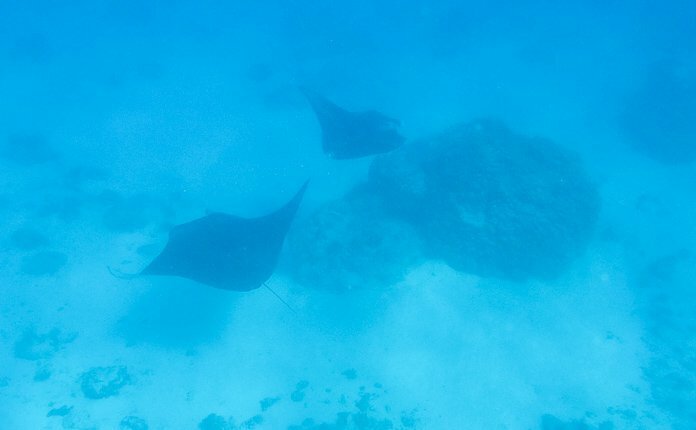 Maupiti has a stunning lagoon and a pass that is home to a family of manta rays! If it is in your budget and you want to see these massive creatures Maupiti is the place to do so. On the main island is a decent beach or you can make the sandy 45 minute stroll, through waist high water, to Motu Auira. Maupiti is 11km around and does not offer much to do other than the fantastic hike up Mount Teurafaatiu. Raiatea is the second largest island in the Society Islands and it is thought to be the launching point for the ancient Polynesian migration. Even with it’s long standing history once you leave the main city of Uturoa the island is mostly deserted. 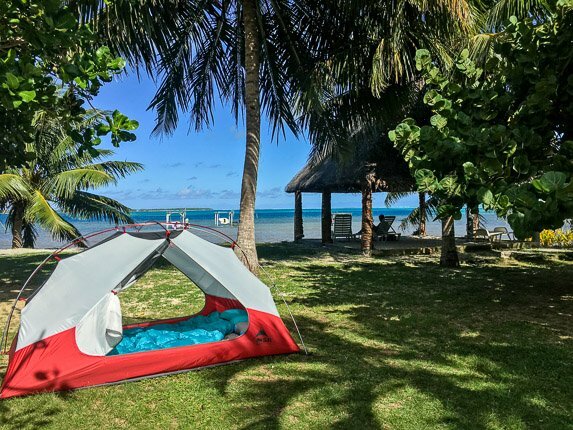 The best budget accommodation on Raiatea is camping at the Sunset Beach Motel. You are provided with your own bathroom, shower and kitchen area. And you also get free access to kayaks, snorkels, fresh fruit and WiFi at the main office. Transportation to and from the airport is included. The Sunset Beach Motel owner will stop on the way from the airport so campers can pick up groceries but after that it is difficult to get anywhere on the island. You will become very secluded without your own mode of transportation. Hitchhiking to Uturoa is possible but it took us a long time to get rides. Hitchhiking to anywhere else on the island is non-existent. There are very few people living outside of the main city and the island has no bus infrastructure. Renting a car or scooter is expensive at $30 USD for 4 hours. Raiatea has no beaches on the main island but it does offer some fantastic hiking, supposedly. The only way to enjoy the island hikes are with an expensive guide. Even with transportation to get to the trail heads, you are required to obtain a permit for the main hike or face a strict penalty (finding the permit office was impossible, no-one wants you to hike without a guide). The other hikes on Raiatea are technically located on private property. 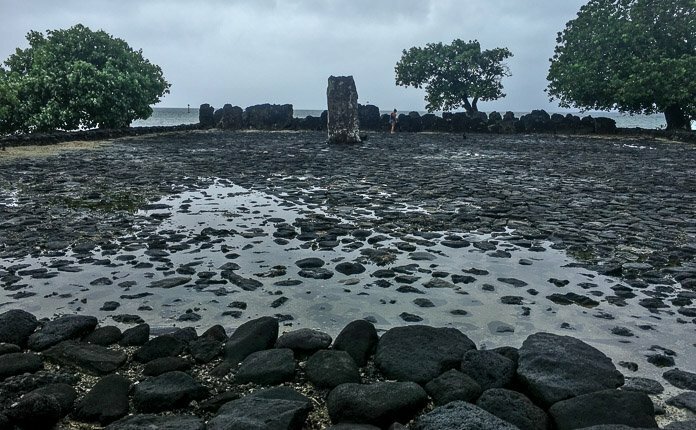 Located on the southern portion of Raiatea, Marae Taputapuatea is one of the most important historical sites to ancient Polynesian culture. 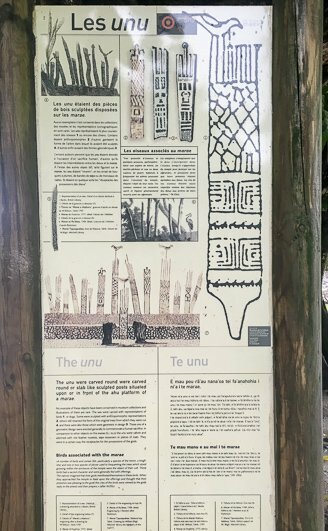 Newly inducted as a UNESCO world history site, unfortunately Marae Taputapuate, even with its importance does not justify renting a car to see it alone. It is an interesting site but if you are on a budget you probably won’t make the trip to the bottom of the island for it. 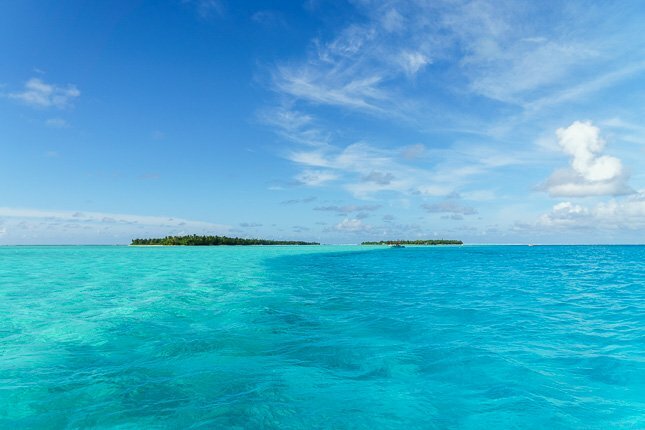 The Vanilla Island, Tahaa is a short ferry ride away from Raiatea. 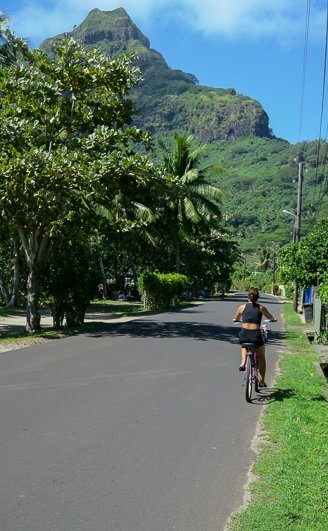 As a wild, miniature version of Raiatea, Tahaa offers some hikes, vanilla farms and other activities but like Raiatea the only way around the island is by renting transportation. 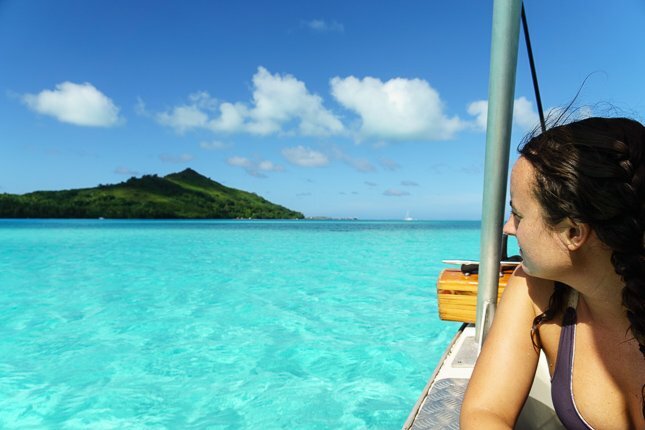 The word Huahine means “pregnant woman” which represents the actual shape of the island. 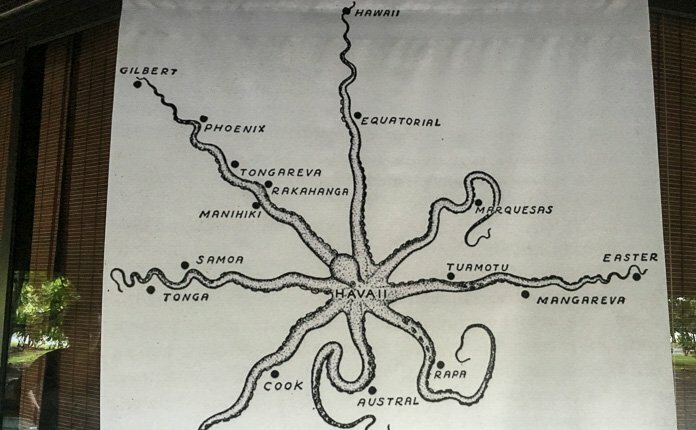 Actually Huahine is two separate islands that are connected by a short bridge. Huahine Nui, the big island and Huahine Iti, the smaller, southern island. Fare is the main town on the island and it is located north, 2.5km away from the airport. 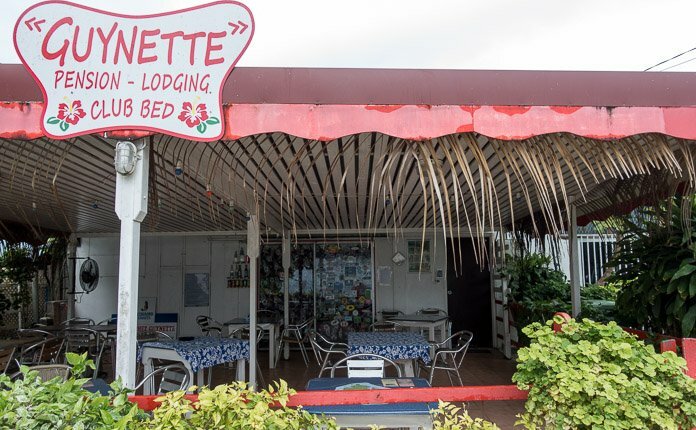 For basic accommodation in Fare, Chez Guynette is the cheapest. 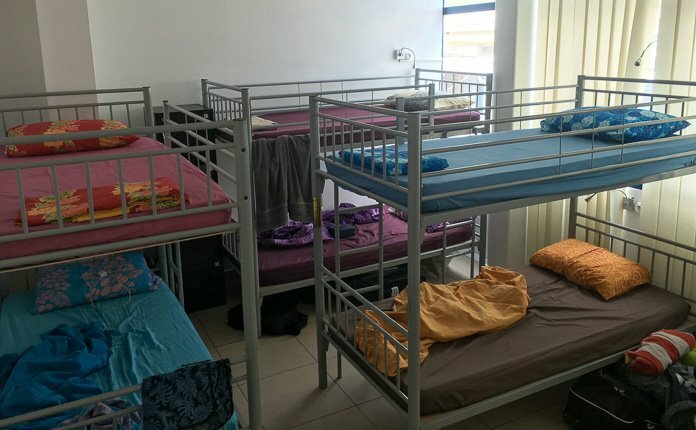 You have the option of a private room or very un-private dorm bed. The owner of Chez Guynette does not really care about her guests only her customers at the attached restaurant. At Chez Guynette transportation to and from the airport is not free and WiFi comes with an additional daily fee. The owner makes sure to change the password every morning. There is a separate kitchen provided for guests to use but in order to get to the kitchen, dining area or bathrooms, you have to walk through the open dorm room. The private rooms for two are cheaper than the price of camping. Camping Hiva Plage is located on the southern tip of the small island. 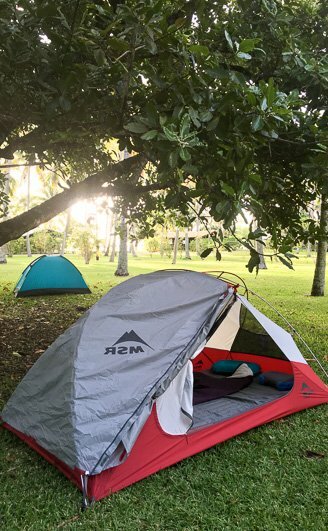 You can put up your own tent or rent a room. 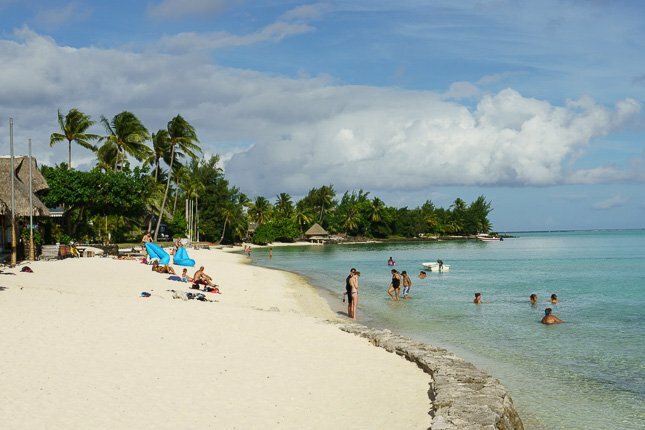 The beach and lagoon are nicer in the south but I was told by fellow travelers – the owners are rude, the campsite is not maintained for the price and that I should avoid staying here unless I wanted to see the small island. There is no public transportation on Huahine. Most of the people live in the main city of Fare. Rentals once again come at a steep price and hitchhiking is not wise. 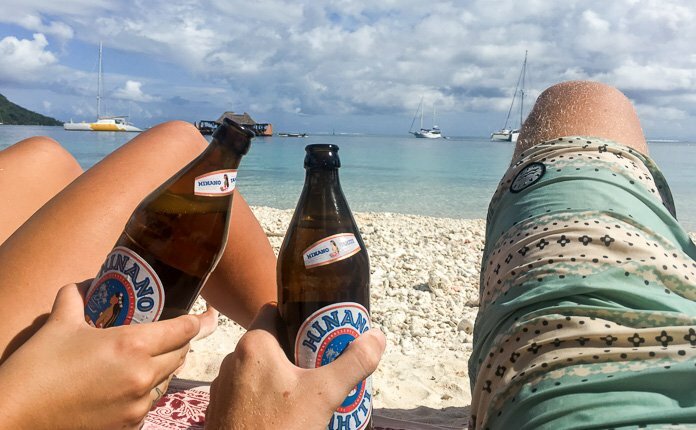 There is a decent beach next to Fare and the Huahine Yacht Club offers some daily drink specials. Small food trucks set up at night, in Fare, providing you with a cheap-ish meal or you can get food at the grocery store. For activities, you can make your way to the lake, nearby town and feed the sacred blue eyed eels. Other than that there is not much you can do without proper transportation. Known for luxury and honeymooner paradise, Bora Bora, is actually one of the most backpacker friendly islands of the Society Islands. Accommodation is a little more expensive but the main island is small enough cycle around and activities are easy to do on your own. The campground in the Lonely Planet does not exist anymore but there is an unnamed campground sign found on the northeast side of the island, nearby Fitiiu Point. I am not sure of it is functionality. AirBnB is becoming a big thing for budget accommodation and one listing allows budget camping. I stayed at Sunset Hill Lodge which was the cheapest option we found at the time. The room was nice, we had a AC, our own bathroom and a private kitchen. The WiFi did not work too well but the owner was friendly and accommodating. Free pickup and drop off. The resorts try very hard to keep their guests on the neighboring motus, meaning that the main island is very underdeveloped, especially for the amount of money that the resorts bring in. Bora Bora has two grocery stores in town and a handful of decent restaurants and shops, which are overpriced due to the resort tourists. At night a few food truck vendor set up for decent food. Bora Bora is one of the few islands in French Polynesia that you can rent a bike and cycle around the whole island. It is possible to sight see and hike on your own. Make sure to visit the old WW2 cannons and Matira Point, the only beach on the island. 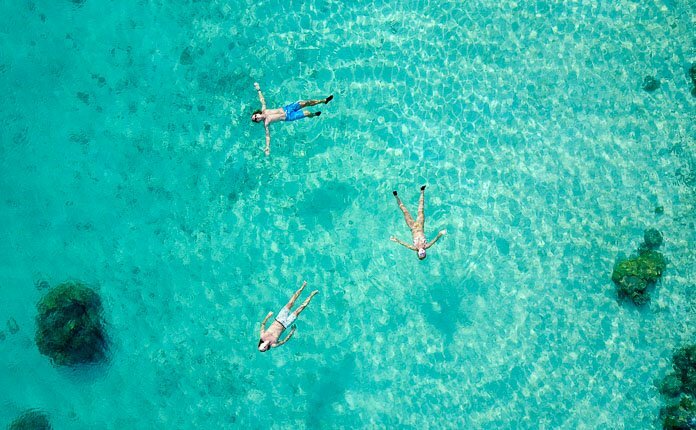 For those who want to do a lagoon tour in French Polynesia and are on a tight budget Bora Bora is the island where I would absolutely recommend doing one. 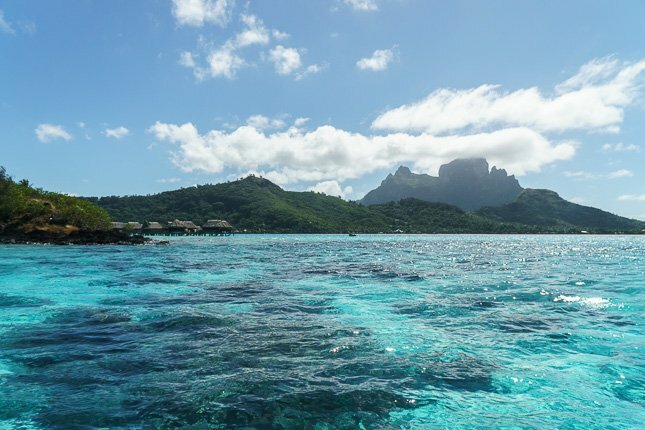 Lagoon tours are expensive but the water surrounding Bora Bora is the best that I have seen anywhere in the world. 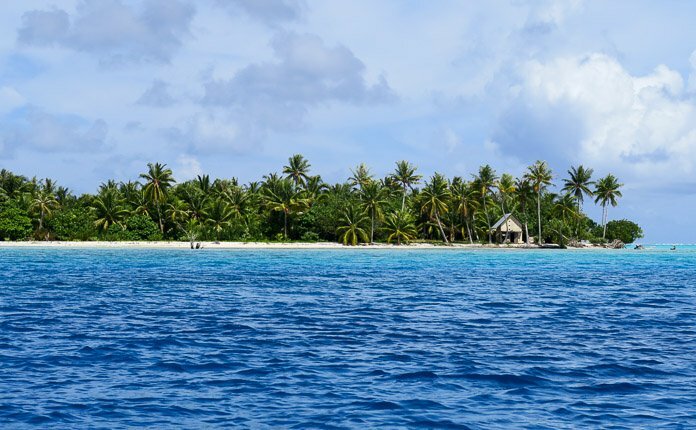 Backpacking the Society Islands is not like backpacking anywhere else. It is beyond beautiful here but with its remoteness, lack of transportation and cost, a budget backpacker will miss out on a lot. 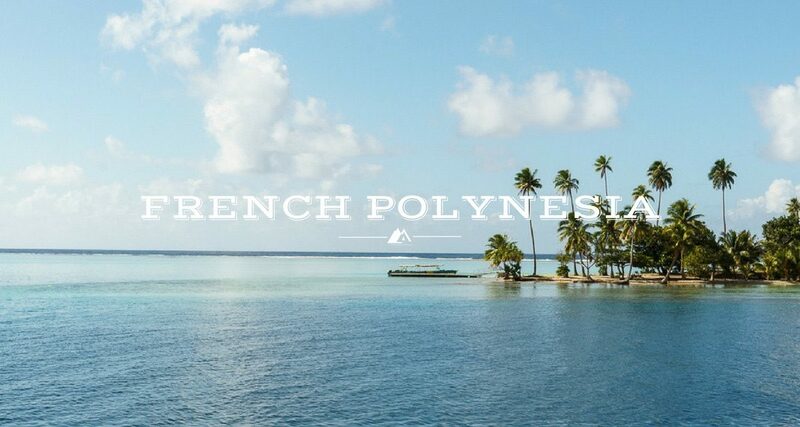 It takes money to experience the true beauty of French Polynesia. But if you do solid research, make a plan, and the South Pacific is your dream, backpacking can be possible. If you are just looking for beaches, hiking, snorkeling I would look elsewhere. 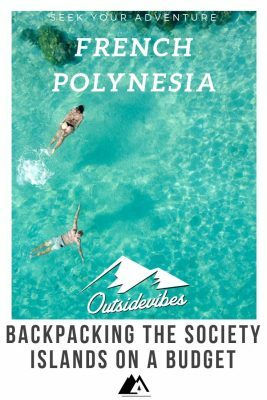 To learn more about backpacking French Polynesia visit the Destination French Polynesia page or check out my Society Island experience. Great post. Thanks for introducing these wonderful islands. The most that attracted me is Bora Bora and I would like to share this post with my friends so that we can plan our trip accordingly. Keep sharing such interesting places through such posts. Thanks for comment and nice words! Feel free to share with anyone, Bora Bora was definitely my favorite island! I did not make it to Moorea but I heard great things about backpacking there. Have a good trip.